It is commonly asserted that, as a subject of academic interest and clinical consideration, anger has not enjoyed the attention that it manifestly deserves (Siegman & Smith, 1994). This is apparent not only within the psychological literature but also psycho-biological literature (Anderson & Silver, 1998). This despite the fact that, experienced as a transient emotion (Novaco, 1975), it is woven into the fabric of our daily circumstances in just the same fashion as any of the other primary emotions. Why this should be so has been the subject of much conjecture. It has, for example, been proposed that it reflects the duality of functional consequences that arise from anger, involving both positive and negative characteristics. Hence, anger is associated with a host of problematic consequences such as loss of personal controls, compromise of critical reasoning faculties, negative health effects and relationship problems. Such an array of difficulties perhaps helps explain the antiquarian view of anger as a base emotion (Novaco, 1994b). In contrast to other domains of emotional difficulty, however, anger has counterbalancing positive characteristics such as the capacity to energise, mobilise, signal emotional state and restore perceived control in situations of threat or challenge. In this context, we consider it likely that our tendency to ambivalence regarding this emotion is reflective of this complexity, and the problems in disentangling the positive and negative components of the presentation. Specifically, we postulate that people have an understandable tendency to suspect some wilful intent on the part of an angry person or patient, even in the face of protestations about loss of control! problem. Any view of such behaviour as wilful therefore implies presence, not absence, of control. This, and similar attributional processes become apparent in the clinical arena, where such patients are often viewed as ambivalent, unmotivated, resentful, unhelpful, and ungrateful (Novaco, Ramm & Black, 2001; Renwick et al., 1997). This may occur even when there is a clinical awareness of just how threatening and challenging our interventions are likely to be viewed by our clients! Such difficulties are all the more surprising given the significant contribution that anger makes across the spectrum of psychiatric/psychological disorders. Hence, anger is acknowledged to contribute to a range of disorders across the Axis I and II domains. It is indicated in such diverse populations as those suffering from depression (Novaco, 1977), post-traumatic stress disorder (PTSD) (Novaco & Chemtob, 1998), psychotic disorders (Haddock et al., 2004), individuals with learning difficulties (Taylor et al., 2002, 2005), disorders of personality (Dahlen & Deffenbacher, 2001; Jones & Hollin, 2004; Linehan, 1993; McMurran etal., 2001), eating disorders (Fassino etal., 2003) and childhood disorders such as attention deficit hyperactivity disorder (ADHD) (Sukhodolsky, Kassinove & Gorman, 2004). Similarly, difficulties can be seen to emerge across the age spectrum, from children (Sukhodolsky, Kassinove & Gorman, 2004) and adolescents (Feindler & Ecton, 1986) through to elderly populations (Renwick, Fox & Edwards, 2002). Despite the above, the status of anger as a clinical problem has been derived from its association in forensic contexts with aggressive behaviour (Novaco, 1994a) - that is, as a causal determinant of aggression and violence. Indeed, in many respects, the nature and extent of this causal relationship is critical to any review or consideration of practice analyses for it is generally acknowledged that anger and aggression are neither synonymous nor unidirectionally or unerringly related. This places considerable challenges on the shoulders of those implementing anger programmes as a means of achieving reductions in violent offences. Given this, it is perhaps surprising that so little attention appears to have been paid within the forensic literature to substantiating the nature and extent of this association. Of particular salience therefore, has arguably been the work on anger as part of the MacArthur (Violence) Risk Assessment Programme (Grisso etal., 2000; Monahan & Steadman, 1994; Novaco, 1994a) as well as our own work with mentally disordered populations (Novaco & Renwick, 1998, 2002). Such work retrospectively, concurrently and prospectively has supported the salience of anger as a potentiator of violence and violence risk in these forensic populations (cf. McNeil, Eisner & Binder, 2003). Consideration of pertinent literature within the anger domain highlights the degree to which surprisingly little attention has been paid, thus far, to matters of nosology. This is despite the fact that clinical and personal experiences accord with the view that anger, both in terms of expression and exposure, is in fact a matter of much complexity and heterogeneity. That is, the circumstances that provoke us, the cognitive attributional processes that mediate our reactions, our emotional and behavioural responses, all can range in form and content in a most dynamic fashion and often as a result of powerful contextual drivers. This is clearly evident in client reports of the circumstances where problems of dyscontrol have (or indeed have not) been manifest. And yet, this diversity of process and presentation is arguably not well represented in current clinical and academic analyses. Some efforts have been made in this regard (as we will argue later) but it must be cautioned that developments in assessment, therapeutic intervention and subsequent outcome evaluation have often either implicitly or indeed explicitly made an assumption of homogeneity. That is, that everyone presenting as having an anger problem is roughly equivalent in respect of such problems and can be broadly treated in the same manner. This is most graphically highlighted in the apparent failure within the literature to agree appropriate criteria for a pathognomic state of anger. As previously stated, this perhaps arises as a consequence of anger's absence from the main diagnostic systems (DSM and ICD). This clearly constitutes less of a difficulty for those therapists and therapies that construe anger as an embedded feature of broader primary disorders. For those whose conceptualisation and interventions are based upon a 'discrete-entity' perspective, this is a major challenge. This uncertainty permeates the assessment, intervention and outcome literature, with the attendant consequence of making critical comparison and evaluation problematic. Practitioners new to the field therefore have to be mindful of the possibility that study populations may or may not reach clinical 'caseness' criteria (even if this is just defined in terms of the judgement of a reasonable practitioner). If sample populations do not, then we would argue that the potential contribution of such work to the clinical literature is likely to be severely limited. Sadly, we caution that much of the current US-based work, being predominantly undergraduate student based, may fall into this category (for example, Deffenbacher, Demm & Brandon, 1986; Del Veccio & O'Leary, 2004; Rimm et al, 1971). Efforts to address this concern can be seen to fall into two categories. The first is the establishment of normative-derived standardised assessment measures. A comprehensive review of such material is clearly beyond the scope of the present analysis but it is indisputable that the two major contributions to the field are the Spielberger State-Trait Anger Expression Inventory (STAXI) (Spielberger, 1996) and theNovaco Anger Scale-Provocation Inventory (NAS-PI) (Novaco, 1994a, 2003). Within the limitations of self-reporting, both measures confer the benefits of being able to quantify global degrees of anger difficulty and also provide the opportunity to consider different constituent aspects of an individual's anger problem. The STAXI offers a number of potentially salient aspects of anger (for example, Anger-in, Anger-out or Anger Expression), which can be seen (at least in part) as an attempt to address the nosological challenges raised previously. In contrast, the NAS-PI has been structured to mirror the constituent treatment components underpinning Novaco's (1975, 1977) treatment approach (described below). Sadly, as we will see, the feedthrough of such assets to treatment development and implementation and, indeed, outcome evaluation, appears somewhat restricted. Even when the utility of such measures is recognised, their use appears to have been predominantly focussed upon relatively crude indication of global change, with the implicit assumption that broadly similar degrees of change across individuals represents the same thing for everyone (i.e. the homogeneity assumption). Ironically the principles obviously driving the development of these measures clearly reflect the converse! There is much need for further conceptual development in this area. The alternative approach to the 'pathology' problem that has been apparent is the call to current psychiatric diagnostic systems to embrace the anger construct directly and hence to provide agreed diagnostic criteria in line with mainstream psychological disorders/syndromes. Although such a move would signal a fairly radical departure from current convention, the development and adoption of PTSD into the psychiatric lexicon reflects how this can be achieved. Such is the enthusiasm of some advocates that 'shadow' criteria have already been proposed outlining how such a diagnostic array might be configured (Eckhart & Deffenbacher, 1995). Though commendable, current proposals appear to reflect a relatively crude adaptation of other Axis I models rather than the process of consensual decision making favoured by, for example, the DSM committees. Certainly, there is little evidence that researchers and practitioners are starting to adopt these criteria in their practice. Nonetheless we commend continuing work on the development of such ideas. Anger addressed within general therapy process e.g. Prescribed e.g. Anger management. forensic anger e.g. Anger treatment. e.g. DBT. e.g. Anger-focussed CAT intervention. e.g. Psychodynamic approaches. e.g. IPT intervention. Figure 13.1 A classification system for anger interventions. Where, then, is one left in addressing the critical questions of when is an anger problem actually an anger problem and how should it best be treated? We believe that, given the areas of uncertainty described above, the most practical solution is to progress an individualised formulation-based approach to intervention. Such an approach could realistically be underpinned by standardised assessments and, indeed, shadow diagnostic criteria but would also make use of detailed aetiological and behavioural evidence to provide a bespoke profile of difficulties in respect of individual clients. This would include consideration of problem intensity, duration, chronicity and severity. We consider this the gold standard in current (individual and group) practice in anger interventions and, as such, published analyses should be evaluated against this yardstick. This is particularly so given that we believe that the typology problem is best resolved by considering anger disorder as a broad-spectrum disorder, ranging from 'normal' expression and experience of anger, through varying co-morbid contributions to psychopathological states, and finally to more discrete and enduring predominant anger problems. 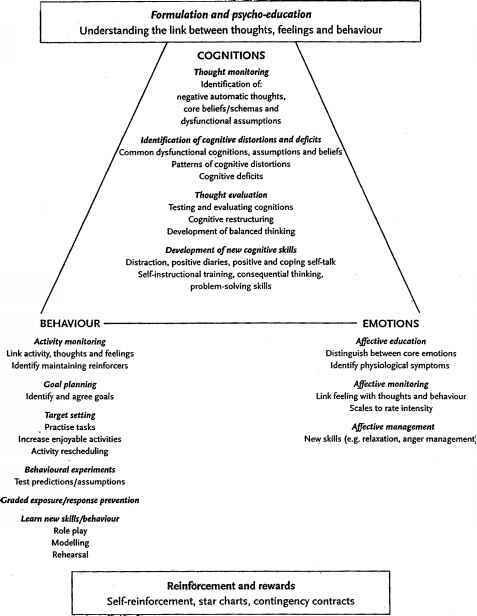 Such a proposal carries the double-edged implication that, although it is arguably more ecologically valid (according with clinical experience) and makes accessible a broader range of clinical activity for consideration, it raises the requirement to offer sufficiently sophisticated mechanisms of assessment of complex anger (as indicated above) and also systems to categorise the diversity of (current) relevant treatment interventions. As described previously, as yet no such agreed categorisation has been generated. We therefore argue that one parsimonious solution is provided by the framework described in Figure 13.1. We believe that classifying therapies within a general continuum (from discrete to integrative) offers a means of capturing and evaluating the rich array of clinical work brought to bear on this most complex of clinical phenomena.